The unique combination is expected to make $100,000 at auction. A DECANTER of whisky is expected to reach more than £61,981 ($100,000) at auction after being showcased around the world. 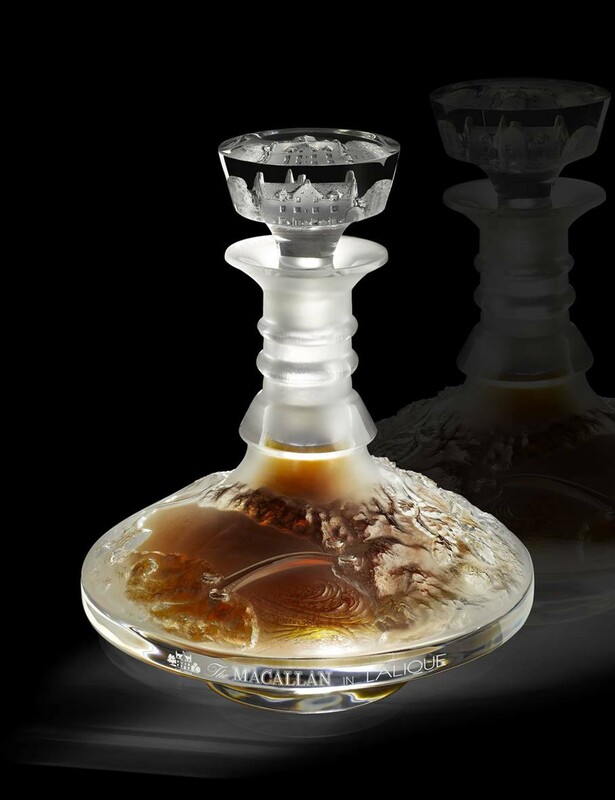 The unique crystal decanter holds 1.5 liters of rare Macallan 64 year old whisky. The estimate means that each dram of the spirit costs £1,032 ($1,666). Raising money for charity:water, it has been touring the world in the last year to whip up interest in the auction. At every stop along the way a 10cl bottle of the rare spirit has been auctioned off along with two special tumblers. In Taipei it went for a whopping £25,408 ($41,000) and so far the auctions have raised £89,845 ($145,000). But it Monday’s auction that is expected to raise the most for the charity, which provides access to clean, safe drinking water in developing nations. The bespoke decanter is crafted by Lalique using the “lost wax” method and holds 1.5 liters of the rare whisky. Up for sale at Sotheby’s auction house in New York, the unique combination will be sold by Jamie Ritchie, head of Sotheby’s Wine in the US and Asia. Ken Grier, Director of Malts, The Edrington Group, said: “We are thrilled to use our well-established relationship with Lalique for a cause so imperative. “The Cire Perdue decanter is something so special and so rare, we knew we should use it to inspire good works and change. Silvio Denz, President and CEO of Lalique, commented: “We have always been proud of our relationship with The Macallan and this latest decanter, a remarkable, unique work of art, holding such an old and rare liquid, elevates our collaboration to new heights. Scott Harrison, founder of charity: water, said: “We are delighted that the proceeds from this historic auction of The Macallan 64 Year Old in Lalique: Cire Perdue will help fund our efforts. Bidding will start at midnight UK time on Monday November 15, and people can participate online. More information can be found at www.macallan.com.